Lisa Takahashi: Can you tell us a bit about how you developed your ideas for ‘The Past Repackaged’ and the story of how this painting came to be? John Whitehill: I paint still life groups selecting, making and arranging objects to suggest a setting for play or perhaps some other mysterious or even sinister possibility. One theme I have been working on during the last couple of years is to reimagine/refigure paintings from art history. Paintings by Giorgio De Chirico, Ambrogio Lorenzetti, Arnold Bocklin and L.S. Lowry have provided starting points for my work. ‘The Past Repackaged’ is the first of a series of four based on Lowry’s industrial landscapes. Putting aside his caricatured and romanticized figures his depiction of northern mills, factories and rows of terraced houses accord well with my intention and working method. 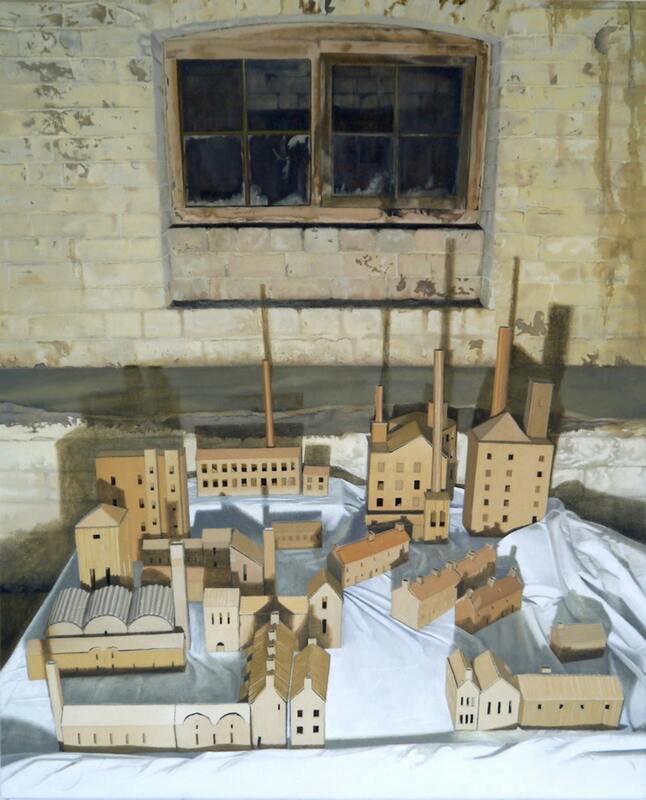 ‘The Past Repackaged’ is a recreation of Lowry’s ‘Industrial Landscape (Ashton under Lyne)’, which I made from card, and tape and set up in the cellar of my house. I then paint the intentionally do it yourself setting including any creases, rips or pieces of sticking tape used to make it. The title acknowledges the material used to construct the still life and references the commercialization of our experience of art and heritage. I was delighted to win particularly having seen the high standard of work selected for the longlist. The publicity generated could spread my work to a wider audience and may bring opportunities as a result. What can admirers of your work expect from your studio next? Currently, I am working on four paintings that are at varying stages of completion. Two are part of a series depicting arrangements of hung, knotted bedsheets to imitate clouds as a child might create in a spontaneous manner as a stage for play. Model aeroplanes give context to the setting. Another piece [that I’m working on] is a reconstruction of Bocklin’s ‘Isle of the Dead’, which is set up in my cellar. 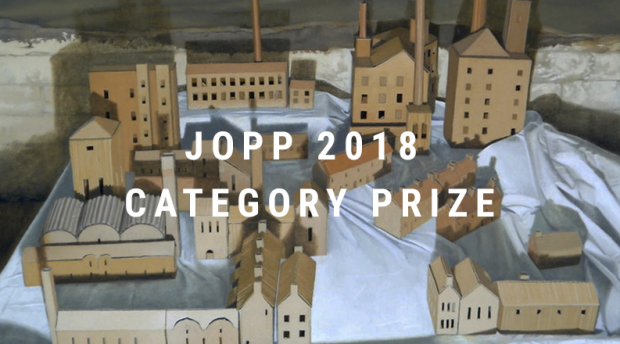 The most recent is the latest in a third theme entitled ‘Souvenirs’ which depict suitcases or boxes containing or acting as a base for small landscapes created from papier mache’ and model railway trees and foliage. They suggest colonization or acquisition from overseas but there is no rigid intention. As with much of my work they are images which interest and engage me. Scrutiny and interpretation I leave to others should they require it. You can view more of John’s work on his website.